2. The Lee Kong Chian School of Medicine, Nanyang Technological University, 50 Nanyang Drive, Research Techno Plaza, Level 4, X-Frontier Block, Singapore 637553. 3. National University of Singapore, Division of Biomedical Engineering, Faculty of Engineering, 7 Engineering Drive 1 Singapore 117576. Keywords: nanoparticles, iron oxide, gold, contrast agents, MRI, optical imaging, miRNA delivery, theranostics. The research on superparamagnetic iron oxide nanoparticles (SPIONs) has been growing exponentially over the last several years. The field continues to drive in the direction of biomedical applications, especially molecular therapeutics by exploiting the immense qualities of SPIONs . This includes the distinctive controllable properties such as size, shape, magnetism, crystallinity and flexibility in fabricating multifunctional SPIONs with fluorescence, targeting ligands, drugs etc, thanks to the advancements in the syntheses and functionalization techniques developed hitherto. There are some excellent synthetic methods in prior arts on the formation of superparamagnetic magnetite (Fe3O4) and maghemite (γ-Fe2O3) SPIONs, with size control, narrow distribution, water solubility and surface functionalization [2-7]. The co-precipitation method is a conventional synthetic paradigm where Fe(II) and Fe(III) salts are co-precipitated in a basic solution in the presence of coating materials such as polymer or dextran (or its derivatives). Although the resulted iron oxide nanoparticles (NPs) are larger in size (ca. 100 nm) and partially crystalline, the particles are readily water soluble where their surfaces are directly functionalized. Alternatively, thermal decomposition method using precursors such as Fe(CO)5, Fe(Stearate)2, with high boiling solvents (octadecene, benzyl ether) and surfactants/ligands (oleic acid, oleylamine) can be used to synthesize smaller sized hydrophobic SPIONs (5-10 nm). In order to impart the SPIONs with water solubility for biomedical applications, water-oil microemulsion method can be employed as a reaction medium for coating a hydrophilic ligand (e.g. silica, peptides) on the hydrophobic surface. Schematic of a multimodal imaging probe. A magnetic nanoparticle, radionuclide, optical tag and targeting moiety are integrated into a single system, which acts as a multimodal molecular imaging platform. Reproduced with permission from Ref. . Copyright (2008) American Chemical Society. SPIONs have been extensively studied as T2 contrast agents in magnetic resonance imaging (MRI) because the negative contrast (darkness) in phantom images can be enhanced by T2 relaxivity of water protons. SPIONs due to their non-toxicity could potentially be used as non-invasive diagnostic tools. Multiple functionalities such as magnetic, optical, radionuclide and specific targeting ligands can be integrated into a single system, which has gained deeper insights in multimodal imaging (Figure 1) . Multifunctional SPIONs have also been used as drug-delivery and photodynamic therapy agents in the emerging area of theranostics. Some excellent review articles appeared in the literature in the area of multifunctional nanoparticles (NPs) [3,8]. This review focuses mainly on the recent advances in multifunctional SPIONs for diagnostics, therapy and macromolecule delivery. We discuss several strategies for the design of molecular imaging probes with an emphasis on MRI, optical imaging/MRI, SPIONs for drug delivery, hyperthermia, and RNA delivery by SPIONs. MRI is one of the non-invasive medical diagnostic techniques. The MR images of normal and abnormal tissues are difficult to differentiate; therefore, specific exogenous contrast agents are needed to increase the contrast and obtain higher resolution and sensitivity. SPIONs have been extensively used as contrast agents for MR imaging of reticuloendothelial targeting and tumors targeting probes. There are two criteria of SPIONs as MR imaging probes: (i) Magnetism: The superparamagnetic SPIONs exhibit a high magnetization when an external magnetic field is applied; the magnetization becomes zero when the external magnetic field is removed. They provide the negative (dark) contrast by enhancing T2/T2* relaxivity of water protons for MRI. SPIONs are generally the core or dopants in the nanoparticles . (ii) Well-developed surface coating and functionality: This includes introducing targeting ligands such as proteins, peptides, antibodies, polymers, carbohydrates, aptamers, DNA, RNA, oligosaccharides onto or surrounding magnetic nanoparticles to improve the target-specific tumors. Other uncommon targeting moieties are radionuclides, organic salts/ionic liquids and graphites. The good water solubility of SPIONs is important to avoid the aggregation. It is also important to modulate the water soluble SPIONs and the coating thickness for r1/r2 relaxations in MRI. Different thickness of coating materials will affect T2 relaxivity of water protons from magnetic field. In the following subsection, we provide some recent examples of different ligands-conjugated MRI nanoprobes. Peptides are one of the commonly employed targeting ligands for cell labeling applications. RGD peptides, cell penetrating and nuclear localizing signaling peptides are mostly used to coat the NPs for increased cell uptake via receptor-mediated endocytosis. Using electrostatic interactions, peptides with positive charges have been bound to negatively charged dextran- modified SPIONs under physiological conditions . The unbound peptides were separated by using the ultra-filtration device and followed by centrifugation. The SPIONs with a tag of amino acids had the specific-recognition as well as the cell transport units. Before proceeding to the selective target binding in vitro and in vivo, the team further examined the stability tests under protein-containing conditions in human blood. SPION-Tat peptide conjugates were used to improve intracellular magnetic labeling of different target cells such as murine lymphocytes, human natural killer (NK) cells and HeLa cells . The peptides had HIV-Tat(FITC - fluorescent isothiocyanate) with the sequence Gly-Gly-Cys-Gly-Arg-Lys-Lys-Arg-Arg-Gln-Arg-Arg-Arg-Lys-(FITC)-NH2 (the italicized amino acids referred to residues 48-57 of the tat protein). The SPIONs were cross-linked with N-succinimidyl-3-(2-pyridyldithio) propionate, and Tat(FITC) peptides were attached to sulfhydryl groups of SPIONs at pH 7.4 through a disulfide exchange reaction. The conjugated SPIONs had a mean particle size of 41 nm and showed 100 fold more efficient internalization into lymphocytes in comparison with unmodified particles. A novel protease-specific nanosensor for MRI was reported . The SPIONs were electrostatically stabilized with a peptide and a methyl-polyethylene glycol polymer (mPEG, molecular weight 5000). The peptide consisted of a cleavage domain with the enzyme and positively charged, arginine-rich coupling domain with a linker sequence. The hydrodynamic diameter of matrix metalloproteinase 9 (MMP)-activatable protease-specific SPIONs was 25 nm. Upon activation of SPIONs, the peptide-mPEG was cleaved, resulting in aggregation and increased T2*-relaxivity. In another interesting work, Xie et al. synthesized SPIONs (<10 nm) coated with a ligand, 4-methylcatechol (MC) and attached a peptide, c(RGDyK) via the Mannich reaction to couple NH2-terminated peptide with SPIONs for specific targeting to integrin αvβ3-rich human glioblastoma (U87MG) tumor cells . Due to the multivalent binding, the c(RGDyK)-MC-Fe3O4 nanoparticles (NPs) showed an increased cellular uptake compared to free RGD peptides. Thus the peptide -conjugated SPIONs have shown great potential as contrast agents for in vivo tumor detection using MRI (Figure 2). (a) Coupling c(RGDyK) peptide to Fe3O4 NPs. (b) Cell uptake of c(RGDyK)-MC-Fe3O4 NPs by U87MG, MCF-7 and U87MG + c(RGDyK) block. (c) MRI of the cross section of the U87MG tumors implanted in mice: (A) without NPs, (B) with the injection of 300 µg of c(RGDyK)-MC-Fe3O4 NPs, and (C) with the injection of c(RGDyK)-MC-Fe3O4 NPs and blocking dose of c(RGDyK); Prussian blue staining of U87MG tumors in the presence of (D) c(RGDyK)-MC-Fe3O4 NPs and (E) c(RGDyK)-MC-Fe3O4 NPs plus blocking dose of c(RGDyK). Reproduced with permission from Ref. . Copyright (2008) American Chemical Society. (A) Schematic drawing of an mAb-coupled fluorescent-magnetic-biotargeting multifunctional nanobioprobes (FMBMN). Flurescent-magnetic bifunctional NPs were covalently coupled with avidin. They were then coated with biotinylated goat anti-mouse IgG (Fc specific) via the biotin-avidin interaction. Mouse monoclonal antibody (mAb) was then attached to the NPs via the binding to the goat antibody. (B, C) Fluorescence microscopic images of anti-CD3 mAb-coupled red nanobioprobes (B) and anti-PSMA mAb-coupled yellow nanobioprobes (C). Here each fluorescent dot came from single mAb-coupled FMBMN containing multiple QDs. Reproduced with permission from Ref. . Copyright (2011) American Chemical Society. Antibodies are proteins with special Y- shapes. They can specifically recognize and bind to antigens in both the recognition phase (cellular receptors) and during the effectors phase (synthesis and secretion) of humoral immunity. Active targeting by monoclonal antibodies (mAbs) combined with SPION is a promising technology for magnetic resonance imaging. Antibody-SPION conjugates can also be prepared by ionic interactions between the two entities through the immobilization of non-modified antibodies. Three antibodies (Immunoglobulin G class) with very different isoelectric points (against peroxidase, carcinoembryonic antigen, and human chorionic gonadotropin hormone) were used to prove the general applicability of the strategy . Polymer coated SPIONs were modified with antibodies (Ab) against human epithelial growth factor receptor 2 (anti-HER2 or anti-HER2/neu), forming SPION-Ab. HER2 is a cell membrane protein that is over-expressed in several types of human cancer cells. SPION-Ab conjugates were used to separate ca. 80% of human breast cancer SK-BR3 cells that were spiked in 1 mL of fresh human whole blood . Cheon and coworkers have fabricated multifunctional magnetic nanocrystals with a cancer-targeting antibody, Herceptin as an MRI nanoprobe for the diagnosis of various types of cancer in vitro and in vivo . 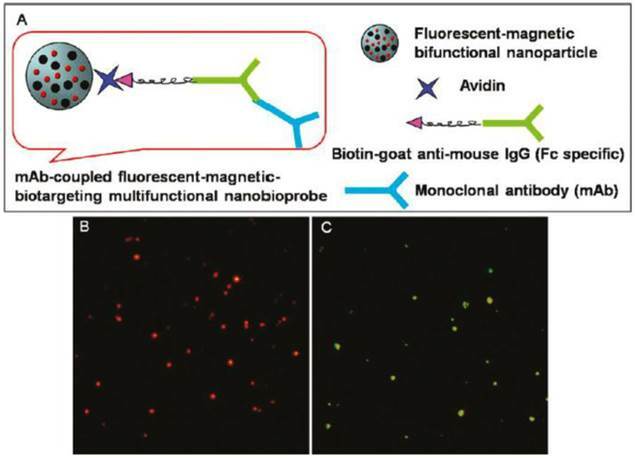 Pang and coworkers expanded the application of the monoclonal antibody (mAb) fluorescent-magnetic-biotargeting multifunctional nanobioprobes (FMBMNs) for detecting and isolating multiple types of tumor cells such as leukemia cells and prostate cancer cells with a capture efficiency of over 96% (Figure 3) . The specific and sensitive detection, and rapid separation of a small number of the above-mentioned two types of cells in a large population of cultured normal cells (about 0.01% tumor cells) were achieved inexpensively without any sample pretreatment before cell analysis. Hence, Herceptin and mAb - conjugated magnetic NPs can be used as effectively for tumor imaging and separation studies. Polymer-functionalized and in particular, PEGylated SPIONs [17,18] can provide improved biocompatibility and colloidal stability. The hydrophobic oleic acid-coated SPIONs were exchanged with a mixture of poly-N-isopropylacrylamide (PNIPAAm) and biotinylated polymer to make them water soluble and finally bioconjugated with streptavidin . Hatton and coworkers have synthesized two types of stimuli-responsive Janus magnetic NPs (MNPs) (5 nm) coated on one side with a pH-dependent but temperature-independent polymer (PAA), and functionalized on the other side with a second polymer that is either pH-independent (PSSNa) or temperature-dependent (PNIPAM) . The Janus MNPs (Janus-PSSNa or Janus-PNIPAM particles) can be dispersed separately at high pH values or low temperature and self-assembled at low pH values or at temperatures greater than 31 ºC. A polyelectrolyte (polysodium-4-styrene sulfonate, PSSS) stabilized MNPs were aligned in linear arrays by an external field . Three composites were prepared, with a range of Fe/monomer ratios of 1:2 (PSSS-Mag1), 3:1 (PSSSMag2 PSSSMag2), and 6:1 (PSSS-Mag3). The magnetic fluids had good biocompatibility and useful for in vivo MRI (Figure 4). Magnetic glycol-nanoparticles (MGNP) based nanosensor system bearing carbohydrates as the ligands was reported . The MNPs could not only detect and differentiate cancer cells but also could quantify their carbohydrate binding abilities by MRI. The system distinguished a range of cells with different metastatic potential and malignant versus normal cells based on “MRI signature”. The application of SPIONs as T1 contrast agents was also explored. Small-sized SPIONs (< 4nm: 1.5, 2.2 and 3 nm) were synthesized via the thermal decomposition of iron-oleate complex in the presence of oleyl alcohol. The hydrophobic NPs became water-dispersible after capping with poly(ethylene glycol)-derivatized phosphine oxide (PO-PEG) ligands. The 3nm-sized iron oxide@PO-PEG NPs gave no toxic response with Fe concentration up to 100 μg/mL in MTT cell proliferation assay. These NPs exhibited a high r1 relaxivity of 4.78 mM-1s-1 and low r2/r1 ratio of 6.12, and regarded as efficient T1 contrast agents (Figure 5). Furthermore, the NPs showed a longer circulation time than the clinically used gadolinium complex-based contrast agent . Block polymers have been used as coating materials for SPIONs. The typical block copolymers used are poly(trimethylammonium ethylacrylate methyl sulfate)-b-poly(acrylamide) with molecular weights 5000-b-30000 gmol-1 and 110000-b-30000 gmol-1. Superparamagnetic SPIONs (maghemite γ-Fe2O3) of 6.3 nm diameter were electrostatically coated by cationic-neutral copolymers. These MNPs showed a better contrast in MRI compared to single NPs . A radical polymerization of monomer N, N-dimethyl-acrylamide (DMMAm) was done in solution with maghemite SPIONs and yielded poly(N,N-dimethylacrylamide) (PDMAAm)-coated SPIONs. The uncoated and PDMAAm-coated SPIONs have been used to label the rat and human bone marrow mesenchymal stem cells (MSCs) and Endorem (dextran-modified SPIONs) as a control. PDMAAm-modified SPIONs showed a higher efficiency of intracellular uptake into human cells and higher T2 relaxivity compared to Endorem and unmodified SPIONs. PDMAAm-modified SPIONs -labeled rMSCs implanted in a rat brain showed better resolution in vivo MRI in comparison with Endorem-labeled cells (Figure 6) . 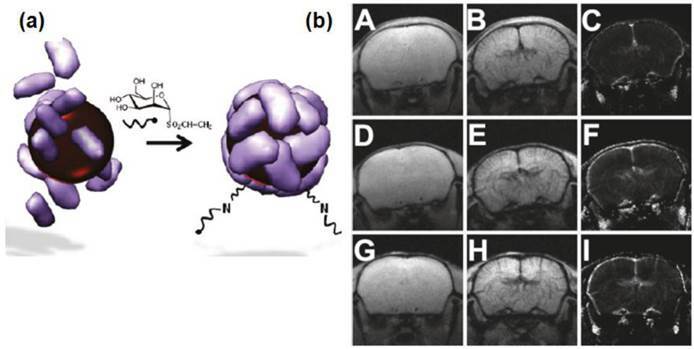 SPIONs were also coated with the protein- or cell-resistant polymer, poly(TMSMA-r-PEGMA) as an MRI agent for in vivo cancer imaging (Figure 7) . The SPIONs did not have any targeting ligands on their surface and yet they may potentially be applied for cancer diagnosis in vivo. These studies demonstrate that polymer - coated SPIONs can be conveniently employed for in vivo cancer imaging. However, it necessitates the toxicity and clearance studies. (A) TEM images of (a) PSSS-Mag1 sample dried without magnetic field of (b) PSSS-Mag1, (c) PSSS-Mag2, and (d) PSSS-Mag3 samples upon drying in a 0.5 T magnetic field. (B) Echo planar image (EPI) of mouse brain (a) before and (b) as PSSS-Mag1 passes through; Fast Low Angle Shot (FLASH) image of mouse brain (c) before and (d) as PSSS-Mag1 passes through. Reproduced with permission from Ref. . Copyright (2008) American Chemical Society. (a) T1 weighted MR images of 3 nm-sized SPIONs. (b) Plot of 1/T1 over Fe concentration of SPIONs with diameters of 2.2 nm, 3 nm and 12 nm. The slope indicates the specific relaxivity (r1). (c, d) T1 weighted MR images of MCF-7 cell pellets after 24 h incubation with SPIONs with diameters of (c) 3 nm and (d) 12 nm. Reproduced with permission from Ref. . Copyright (2011) American Chemical Society. TEM micrographs of rMSCs labeled with (a) PDMAAm-coated γ-Fe2O3 NPs, (b) Endorem, and (c) uncoated γ-Fe2O3. Arrows indicate NPs inside the endosomes. A, autophagosome; N, nucleus; n, nucleolus; c1 and c2, cell 1 and cell 2, respectively. Scale bar: a, c, 500 nm; b, 200 nm. Reproduced with permission from Ref. . Copyright (2009) American Chemical Society. 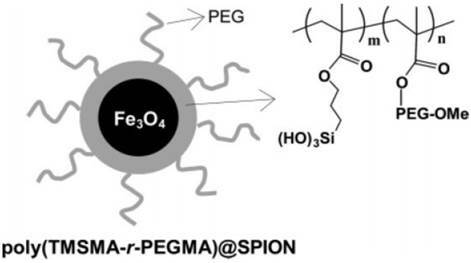 Polymer-coated superparamagnetic SPION and chemical structure of the PEG-silane copolymer, poly(TMSMA-γ-PEGMA). Reproduced with permission from Ref. . Copyright (2006) American Chemical Society. Valero et al. demonstrated the synthesis of carbohydrate-coated SPIONs as MRI nanoprobes . They showed the pH-driven assembly-disassembly natural process that occurred in apoferritin and found it effective for encapsulating maghemite SPIONs of 4 and 6 nm. The SPIONs were further functionalized with two carbohydrates, N-acetyl-D-glucosamine and D-mannose vinyl sulfone derivatives. The representative mouse brain images acquired before and 120 s after administration of contrast agents and corresponding regional cerebral blood volume maps (rCBV) maps are shown in Figure 8. Similar to Endorem, post-contrast images and rCBV maps obtained with Apomaghemite samples depicted very well the space arrangement of cerebral vessels. This study confirmed that Apomaghemite SPIONs could serve as promising contrast agents. Furthermore, the carbohydrate-functionalized Apomaghemite NPs retained their recognition abilities, as demonstrated by the strong affinity with their corresponding carbohydrate-binding lectins. Monosaccharides have been used as targeting ligands for sensing proteins and bacteria. A versatile approach for the immobilization of unmodified monosaccharides onto SPIONs was reported by Yan team . Covalent coupling of D-mannose onto SPIONs by using CH insertion reaction of photochemically activated phosphate-functionalized perfluorophenylazides (PFPAs) resulted in glyco-NPs. The surface-bound D-mannose had mannose-specific receptor and showed the recognition ability toward Concanavalin A and Escherichia coli strain ORN178. These studies imply that the carbohydrate-conjugated SPIONs might be useful in clinical diagnosis, sensing and decontamination. (a) Glycosylation of Apomaghemite NPs by reaction of N-acetyl-D-glucosamine or D-mannose vinyl sulfone derivaties with the amine group naturally present in the Apomaghemite NPs to make them recognizable by lectins. (b) Representative mouse brain images acquired before and 120 s after administration of contrast agents and corresponding rCBV maps. Upper line: Precontrast (A), postcontrast (B), and rCBV map (C) obtained with APOMAG-4. Middle line: Precontrast (D), postcontrast (E), and rCBV map (F) obtained with APOMAG-6. Lower line: Precontrast (G), postcontrast (H), and rCBV map (I) obtained with Endorem. Reproduced with permission from Ref. . Copyright (2011) American Chemical Society. Aptamers are single-stranded oligonucleotides, which can recognize their targets with excellent specificity and high affinity. They are rival candidates to antibodies, and emerge as potential conjugation platform for a variety of NPs. Aptamer-conjugated magnetic NPs have been used for a variety of applications, particularly, as magnetic relaxation switches for the detection of molecular interactions  and for magnetic extraction of targeted cells in a variety of mixtures [30, 31] and also for cancer cell separation and fluorescent labeling with SPION-plasmonic Au bimodal NPs . Jan et. al. have designed a CG-rich duplex containing prostate-specific membrane antigen (PSMA) aptamer-conjugated thermally cross-linked superparamagnetic IONs via a hybridization method (Apt-hybr-TCL-SPION) for prostate cancer-specific nanotheranostic agents . The Apt-hybr-TCL-SPION thus further loaded with doxorubicin (Dox) molecules through the intercalation to the CG-rich duplex containing PSMA aptamer as well as electrostatic interactions. MRI results showed that the Apt-hybr-TCL-SPION preferential binding towards target prostate cancer cells (LNCaP) both in vitro and in vivo. The resulting Dox loaded Apt-hybr-TLC-SPION gave the selective drug-delivery efficacy in the targeted prostate cancer cells xenograft mouse model. Wang et. al. also demonstrated the conjugation of aptamers (A10 RNA) to SPIONs via gel electrophoresis . They showed that the A10 aptamer physically conjugated with Dox and the Dox was released in a controlled fashion to PSMA expressing PCa cells. The aptamer-SION bioconjugates gave the efficacy as targeted imaging agents using MRI. Lu et. al. also combined aptamer technology with SPIONs using specifically method to develop adenosine DNA aptamer-functionalized SPIONs . The surface of SPION was functionalized with N-succinimidyl 3-(2-pyridyldithio)-propionate (SPDP) and further coupled to thiol-modified DNA (3' Adap or 5' Adap). T2-weighted MR images showed the quantitative analysis performance with different adenosine concentrations. While the adenosine concentration increased, the brightness of the T2 image also increased. SPIONs, functionalized with aptamer were used for MRI detection of human α-thrombin protein (Figure 9) . The contrast agent was designed based on the assembly of the aptamer functionalized SPIONs in the presence of thrombin. The system was specific to thrombin and a detectable change in MRI signal was observed at 25 nM thrombin in human serum. Changes were not observed with other control analytes such as streptavidin and bovine serum albumin or with inactive aptamer functionalized NPs. These studies demonstrate that aptamer - conjugated SPIONs can be used as potential theranostics agents. DNA has been used as a template to electrostatically assemble Fe2O3 MNPs while retaining its biochemical recognition properties . Upon stretching, the templated DNA could be digested by the BamH1 restriction enzyme. 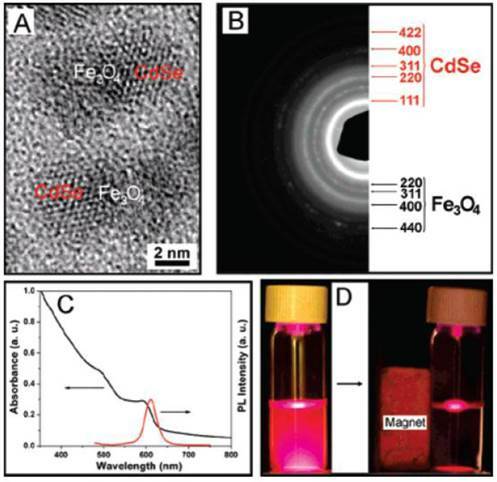 Graphite-coated magnetic FeCo core-shell nanocrystals for few-cells enrichment and detection were reported . FeCo nanocrystals were synthesized by a chemical vapor deposition method and became water soluble via coating the graphite shell with DSPE-PEG-NH2 and C18-PMH-mPEG polymers, while preventing the magnetic core from oxidation and degradation. These functionalized MNPs were stable and suitable for significant biological applications, such as cell staining, manipulation, cancer cell separation, enrichment and detection. The MNPs -stained cells showed directed motions under external magnetic manipulation. Ionic liquids are considered as organic solvents with high polarity and a pre-organized solvent structure. Crystalline NPs can be synthesized by using ionic liquid at ambient temperature . 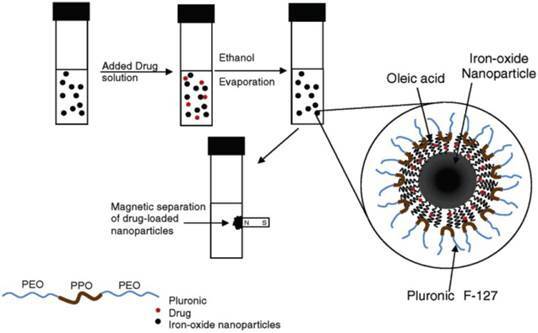 Warner and coworkers have developed magnetic NPs coated with a group of uniform materials based on organic salts by using in-situ ion exchange water-in-oil (w/o) microemulsion approach . These MNPs could potentially be applied in drug delivery, MRI and protein separations. In another interesting work, Louie and coworkers have reported the synthesis of a reversible T2 contrast agent that is capable of modulating the relaxation time in response to light irradiation . A spiropyran (SP) derivative that changes conformation between hydrophilic and hydrophobic isomers in response to light, has been covalently attached to dextran sulfate coated iron oxide nanoparticles (ADIO). The light induced reversible aggregation of MNPs has been found to modulate the T2 relaxation time (Figure 10). (a) The CLIO NPs (shown as red spheres) have been modified with either Thrm-A, A DNA aptamer (shown as blue lines) that binds to fibrinogen-recognition exosite of thrombin, or Thrm-B, a DNA aptamer (shown as green lines) that binds to the heparin-binding exosite of thrombin. Addition of thrombin consisting of both fibrinogen (as blue donut) and heparin (as green donuts) exosites resulted in aggregation of CLIO NP assembly, reducing the T2 relaxation time. The DNA sequences are shown at the bottom. The drawing is not to scale. (b) Contrast change in T2-weighted MR image in 1:1 CLIO-Thrm-A and CLIO-Thrm-B mixture with 0, 10, 25 and 50 nM thrombin (first column), BSA (second column) and streptavidin (third column). Reproduced with permission from Ref. . Copyright (2008) American Chemical Society. (a) Proposed mechanism of reversible aggregation. 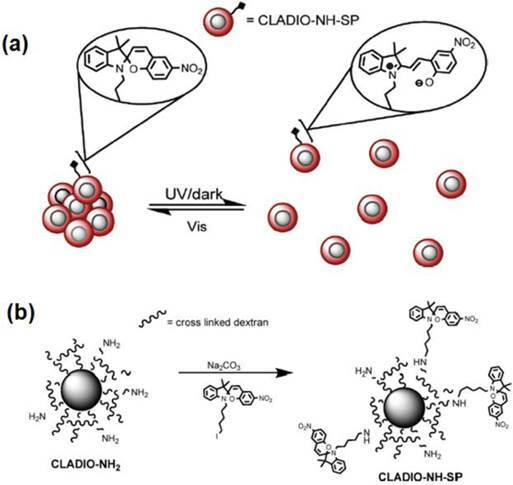 (b) Preparation of cross linked dextran sulfate coated iron oxide nanoparticles (CLADIO), functionalized with amine groups and spiropyran (SP). Reproduced with permission with from Ref. . Copyright (2010) American Chemical Society. Each imaging modality (optical and MRI) has its own strengths and limitations but the strengths of each modality can be combined in bimodal imaging probes to improve the diagnostic quality of tumors. MR offers detailed anatomic imaging while optical imaging provides the real-time molecular targeting of images. SPIONs are generally combined with either quantum dots (e.g. 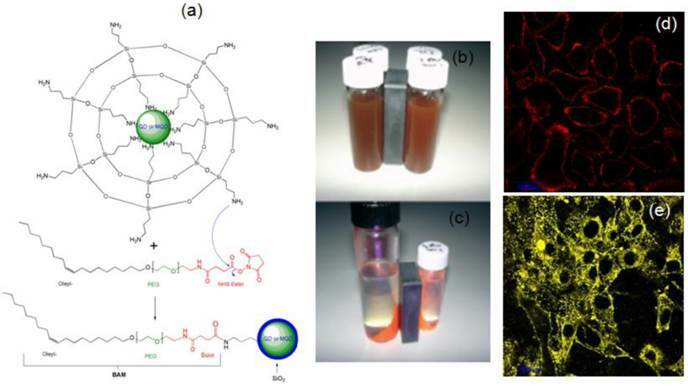 CdSe/ZnS) or fluorescent dyes and used as bimodal magnetic-fluorescent nanoprobes for cell labeling and MRI applications. The fluorescent (CdSe QDs) and magnetic (Fe3O4 SPIONs) heterodimers were fabricated in the group of Xu and were used for the intracellular tracking. Figure 11 details the HRTEM, selected area electron diffraction (SAED), absorption and fluorescence spectra of Fe3O4-CdSe NPs in hexane solution, and the optical photographs illustrating the fluorescence and magnetic properties . Our group has been actively involved in the synthesis of QDs and magnetic QDs (MQDs) [43-48]. We have successfully demonstrated the magnetic and fluorescent properties of Fe2O3-CdSe MQDs, silica -coated QDs or MQDs and their application in cell labeling (Figure 12) . The silanization using aminopropyl triethoxysilane (APS) in a reverse microemulsion produced thin silica coating on bare CdSe QDs or Fe2O3-CdSe MQD with surface NH2 groups. The methoxy groups of APS were hydrolyzed and condensed with another APS, exposing surface amine groups on the silanized QDs (SiO2/QDs) for conjugation with oleyl-O-poly(ethyleneglycol)-succinyl-N-hydroxysuccinimidyl ester, denoted as bio-anchored membrane (BAM). The reaction between the amine group and NHS ester resulted in a covalent amide bond formation, leaving the exposed oleyl group for the effective targeting of cell membrane. The labeling of live cell membranes (HepG2 human liver cancer cells and NIH-3T3 mouse fibroblast cells) using confocal laser scanning microscopy (CLSM) indicated the successful conjugation of silica-coated QDs or MQDs with BAM. Jeong and coworkers have developed oleyl-chitosan (oleic acid-conjugated chitosan) SPIONs . In aqueous solution, oleyl-chitosan could self-assemble into core-shell structures and provide the core compartment for the loading of SPIONs. Oleyl-chitosan@ SPION showed good enhanced MRI sensitivity in MRI. Cy 5.5 dye was functionalized on the oleyl-chitosan for near-infrared (NIR) in vivo optical imaging. SPION-loaded Cy5.5-conjugated oleyl-chitosan NPs were injected intravenously into a tumor-bearing mice. 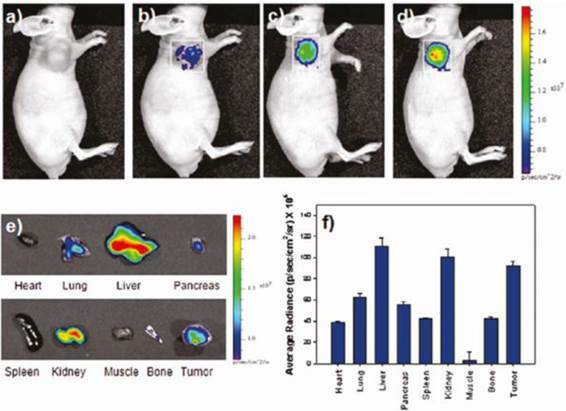 Both NIR fluorescence and MR imaging showed the detectable signal intensity and enhancement in tumor tissues via enhanced permeability and retention (EPR) effect (Figure 13). Zhang et al. reported PEG coated SPIONs for both MRI and optical imaging. The biocompatible PEG coating bearing amine functional group could serve as a platform to incorporate a variety of targeting, therapeutic or imaging ligands . In this case, chlorotoxin was conjugated to PEG@SPION and Cy5.5 (a near-infrared fluorescent dye). These SPIONs have shown specifically to accumulate in xenograft tumors of a brain tumor mouse model. Furthermore, they did not have any toxicity or negative health effects from the results of histopathology and blood toxicity assays. Huang and coworkers have designed hyaluronic acid (HA) coated SPIONs for targeting activated macrophages . The HA-coated SPIONs had specific biological recognition with the receptor CD44. The cell uptake studies showed a significant uptake of SPIONs by activated macrophage cell line THP-1 and enabled MRI of THP-1 cells. The dual modal probes could be used to track the magnetite core and cargo individually. The magnetite core was only present inside the cells while the cargo fluorescein was found to be delivered to the cell nucleus. This study reveals the fact that the HA-based SPIONs have great potential in nucleus targeting drug delivery. Howes et al. reported a simple synthesis of multicolored bright fluorescent-magnetic NPs by encapsulating hydrophobic conjugated polymers and SPIONs in phospholipid micelles . These SPIONs were shown to be magnetically responsive and simultaneously fluorescent as bimodal imaging agents. These bifunctional NPs had shorter effect on the transverse T2* relaxation time and yet showed their potential as MRI contrast agent. They were also successfully taken up by SH-SY5Y neuroblastoma cells and showed their potential in fluorescence imaging. (A) HRTEM image and (B) EDP analysis of Fe3O4-CdSe heterodimers. (C) The UV-Vis and fluorescence spectra of Fe3O4-CdSe NPs in hexane solution. (D) The fluorescence images of the hexane solution of Fe3O4-CdSe NPs before and after attraction by a small magnet (excited by a UV lamp, λex = 365 nm). Reproduced with permission from Ref. . Copyright (2008) American Chemical Society. (a) A scheme depicting the silica coating of QDs and MQDs in a reverse microemulsion. (b, c) Photographs of (b) MQDs under white light before magnetic harvesting; (c) Magnetic and fluorescent properties under UV excitation at 365 nm of harvested red MQDs. (d, e) CLSM images showing the labeling of (d) HepG2 human liver cancer cells and (e) NIH-3T3 mouse fibroblast cells, of cell membranes with BAM-SiO2-QDs.Reproduced with permission from Ref. . Copyright (2007) Wiley-VCH. In vivo NIRF images of U87MG-bearing mice. The images were obtained (a) before injection and at (b) 1h, (c) 3h, and (d) 5h after injection of SPION -Cy5.5-oleyl-chitosan NPs. (e) Ex vivo NIRF images of major tissues excised from the mice at 5h post injection. (f) A quantification of the ex-vivo tissues was recorded as average radiance (p/s/cm2/sr). Reproduced with permission from Ref. . Copyright (2011) American Chemical Society. Positron emission tomography (PET) is a useful tool for whole-body imaging with high detection sensitivity (< picomolar range) and therefore, it provides a high sensitivity metabolic images [53-55]. The combination of MRI/PET has shown the synergistic effect and given the high anatomical spatial resolution of MRI and the unparalleled sensitivity and functional imaging of PET. Nanoparticles with unique functionality characteristics are well-suited as probes for molecular imaging. 18F and 64Cu are commonly used as radionuclides in positron emission tomography (PET). 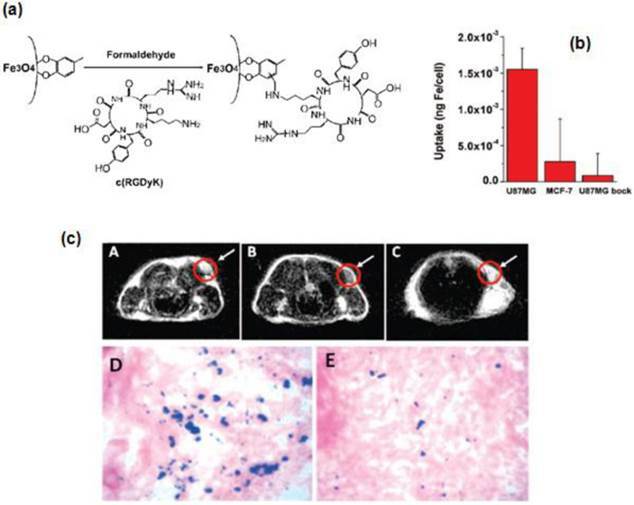 Louie and coworkers have developed radionuclide-magnetic dual mode PET/MRI active probes using SPION conjugated with amine-activated DOTA (1,4,7,10-tetraazacyclo-dodecane-1,4,7,10-tetraacetic acid) 64Cu(II) for targeting vascular inflammation . Bao and coworkers have developed dual-modality PET/MRI NPs comprising of monocrystalline SPION core coated with PEGylated phospholipids and the chelator, DOTA to allow labeling with positron-emitting 64Cu. Radiolabeling with 64Cu at high yield and high purity were achieved. The 64Cu-SPION probes exhibited strong MRI and PET signals . The surface of SPIONs has been modified to incorporate the drugs such as doxorubicin (Dox), one of the clinically approved anticancer drugs for breast cancer. The Pluronic surfactant stabilized oleic acid - coated SPIONs were developed as shown in Figure 14 . The water insoluble drug, Dox was loaded into the above SPIONs and released slowly over 2 weeks under in vitro conditions in breast and prostate cancer cell lines. Chen et al. described a method to bind doxorubicin covalently to Fe3O4@SiO2 core-shell NPs via an amide bond, where the active -COOH group on NPs reacted with the -NH2 group of Dox molecules . The Dox-loading was 86.5% and the release behavior was studied under low pH conditions in the presence of protease. Hyeon and coworkers have developed uniform mesoporous silica NPs (MSN) decorated with dye and multiple magnetite SPIONs for MRI, fluorescence imaging and drug delivery (Figure 15) . This system has successfully enabled the delivery of DOX into the tumor sites, as demonstrated by MR animal imaging. Formulation of SPIONs and the process for drug loading. Reproduced with permission from Ref. . Copyright (2005) American Chemical Society. The synthetic procedure for dye-doped mesoporous silica NPs (MSN). Reproduced with permission from Ref. . Copyright (2010) American Chemical Society. 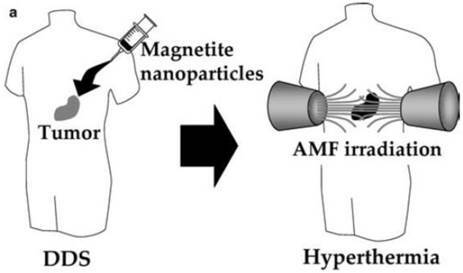 Hyperthermia using magnetite nanoparticles. Scheme of hyperthermia treatment. Magnetite nanoparticles are concentrated in tumor tissue by the DDS. Then the nanoparticles are irradiated with an AMF produced outside the human body, resulting in tumor-specific hyperthermia. Reproduced with permission from Ref. . Copyright (2005) Springer-Verlag 2005. Multifunctional SPIONs have been used in hyperthermia treatment of cancer. Figure 16  shows a schematic of hyperthermia using SPIONs. In this therapy, the NPs are exposed to an oscillating magnetic field (~ kHz-MHz) and heat is generated to kill the tumor cells due to two mechanisms that depend on the size of the particles: a) Brownian modes: for NPs < 100 nm in diameter (single domain NPs), heat produced due to friction between oscillating particles. b) Neél modes: for larger particles, heat produced due to the rotation of the magnetic moment with each field oscillation . Amphipathic polymer pullulan acetate (PA)-coated SPIONs were prepared for in vitro hyperthermia therapy. The spherical SPIONs had the mean diameter of 25.8 nm ± 6.1 nm. These PA-coated SPIONs had high magnetite content (51.9 emu/g saturated magnetization) and also had good biocompatibility. These SPIONs had excellent therapeutic efficacies on KB cells stemming of 56% and 78% at 45 ºC and 47 ºC, respectively . Hong and coworkers had synthesized the Fe3O4-chitosan NPs for hyperthermia . 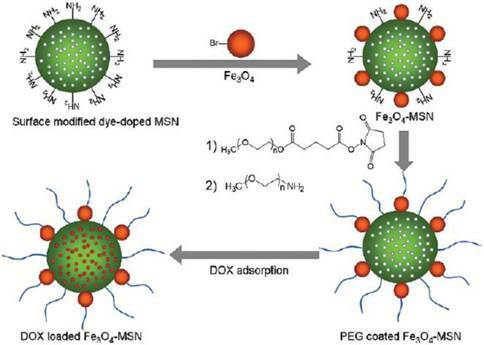 Baker and coworkers demonstrated the biocompatible phospholipid core/shell-type iron/iron oxide nanocomposite particles for magnetic hyperthermia cancer therapy . The nanocomposites showed more effectiveness in hyperthermia treatment because the heating in an alternating magnetic field was better than iron oxide NPs alone. Zhang and coworkers reported that magnetic cobalt spinel ferrite NPs coated with biocompatible polygalacturonic acid functionalized with ligands could be used for specific in vitro and in vivo targeting of expressed EphA2 receptors on ovarian cancer cells . Folate-conjugated SPIONs were used for solid tumor targeting in specific magnetic hyperthermia mediators . The folate surface of maghemite NPs could recognize the folate receptor and was proven by folate receptor expressing cell lines or by radio-labeled folic acid in competitive binding experiments. Water-dispersible sugar-coated SPIONs were designed as magnetic fluid hyperthermia heat mediators and T2 negative contrast agents for MRI . SPIONs of ca. 16-18 nm had good transverse relaxivity and large heat release upon application of radio frequency (RF) electromagnetic radiation with amplitude and frequency close to the human tolerance limit. The authors claimed that these particles could be used as an efficient bifunctional targeting system for theranostic applications. Initially, the hydrophobic oleic acid stabilized SPIONs synthesized via thermal decomposition method were made water soluble by the displacement of the stabilizing agents, and by covalent grafting of the carbohydrate derivatives via the phosphonate function. Iridium-complex-functionalized Fe3O4/SiO2 NPs were designed for three-in-one system . The iron oxide NPs provided the capability for MRI. The phosphorescent iridium complex made it well suited for phosphorescent labeling and singlet oxygen generation to induce apoptosis of cancer cells. RNA-based therapeutics such as small interfering RNA (siRNA) and microRNA (miRNA) provide a promising strategy to treat cancer by targeting the specific proteins involved in the mechanism of proliferation, invasion, anti-apoptosis, drug resistance, and metastasis. NPs complexed with polycations and attached to cholesterol groups or conjugated with cell-surface receptors are commonly used for in vivo delivery of therapeutic siRNAs. The cholesterol groups can enhance their stability before systemic delivery. Furthermore, the receptor-mediated cell uptake and release by endosomes would enable for the targeted delivery of the siRNAs . Cancer cell targeted gene silencing was reported with multifunctional manganese-doped SPIONs for simultaneous delivery and multimodal imaging . The particles were coated with bovine serum albumin (BSA), PEG, and functionalized with RGD peptide (Arg-Gly-Asp) and therapeutic siRNA labeled with Cy5 in all-in-one system. In another interesting work, Moore and coworkers have developed dual-mode imaging probes for in vivo transfer of siRNA and demonstrated the simultaneous imaging of tumors by high-resolution MRI and near-infrared in vivo optical imaging (NIRF) . These probes consisted of dextran-coated SPION labeled with a near-infrared dye, Cy5.5 and covalently linked to siRNA molecules specific for the inhibition of GFP expression. Furthermore, this probe was modified with a membrane translocation peptide, myristoylated polyarginine peptides (MPAP) for intracellular delivery. Targeted delivery of RNA-based therapeutics for cancer therapy remains a challenge. Huang and coworkers have developed a NP formulation based on liposome-polycation-hyaluronic acid (LPH). These NPs have been modified with tumor-targeting single-chain antibody fragment (scFv) and used for systemic delivery of small interfering RNA (siRNA) and microRNA (miRNA) into experimental lung metastasis of murine B16F10 melanoma. The tumor growth was found to be inhibited by NPs containing siRNA and miRNA . Wang and coworkers have developed PEGylated LPH NP formulation modified with cyclic RGD peptide (cRGD) for specific and efficient delivery of miRNA or its anti-miRNA antisense oligonucleotides (AMOs) into endothelial cells, targeting αvβ3 integrin present on the tumor neovasculature. They have also demonstrated that cRGD modified LPH NPs have potential in miRNA therapeutics for anti-angiogenesis . While the importance of microRNAs (miRNAs) in cancer treatment or manipulation of genetic expression has been increasingly recognized for developing miRNA-based therapies, the controlled delivery of miRNAs into specific cells constitutes a challenging task. Lung cancer is the leading cause of cancer deaths in western countries and several studies demonstrated that miRNAs are actively involved in tumor development by serving as tumor suppressors, oncogenes or both. In lung cancer, miRNAs may serve as both diagnostic and prognostic biomarkers as well as regulate in vitro and in vivo tumor progression. However, miRNA-based therapy is faced with several challenges including lack of tissue specificity, lack of optimal delivery systems, poor cellular uptake and risk of systemic toxicity. Lee and coworkers reported a cationic lipoplexes based miRNA delivery system for the development of miRNA-based therapeutics in lung cancer treatment (Figure 17) . Recently, cell transfection studies on miRNA-AuNPs have demonstrated the efficient gene knockdown in the functional luciferase assay and their potential in biosensing or targeting (Figure 18) . The surface chemistry of Au NPs can dictate the cellular uptake. In a recent study, RNA-AuNP caused no significant changes in gene expression, cell cycle progression, or apoptosis induction in HeLa cells . We believe that the miRNA-AuNP could be taken up by the receptor-mediated endocytosis and Au NPs released by endosomes. (Left) A scheme depicting miRNA-cationic lipoplexes for lung cancer delivery. (Right) Tissue distribution of Cy5-G3139 containing lipoplexes and Cy5-G3139 NeoFX complexes. 4 h after intravenous administration, tissues were harvested and then Cy5 fluorescence signals measured. A typical Cy5 fluorescence images of whole tissues. Note: Cy5-G3139: Cy5 dye labeled oligodeoxynucleotides (Cy5-G3139, 5'-Cy5-TCT CCC AGC GTG CGC CAT-3') and NeoFX: a transfection agent. Reprinted with permission from Ref. . Copyright (2011) American Chemical Society. Illustration of the preparation of miRNA-AuNP conjugates for delivering miRNAs to cells where miRNA is labeled with fluorescent dyes (e.g., Cy3 or Cy5). Reprinted with permission from Ref. . Copyright (2012) American Chemical Society. Scheme of the miRNA assay based on the two-stage EXPAR and single-QD-based nanosensor. Reprinted with permission from Ref. . Copyright (2012) American Chemical Society. MicroRNAs (miRNAs) play important roles in a wide range of biological processes, and their aberrant expressions are associated with various diseases. 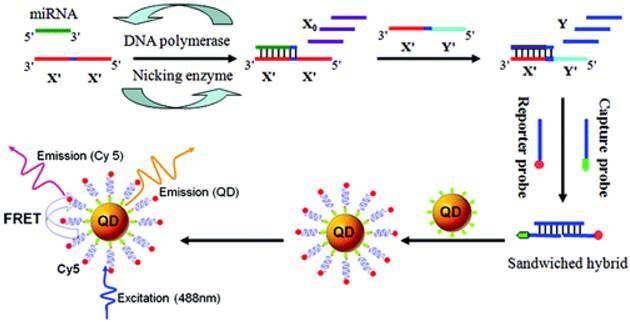 Highly sensitive and specific miRNA detection method based on the two-stage exponential amplification reaction (EXPAR) and a single QD (Streptavidin-coated 605 nm emission) -based nanosensor, has recently been developed (Figure 19) . In comparison with conventional PCR with the involvement of thermal cycling, EXPAR offers the following advantages: a) proceeds at a constant temperature; b) provides high amplification efficiency, which can rapidly amplify short oligonucleotides (106 -109-fold) within minutes and c) a detection limit of as low as 0.1 aM and can even discriminate single-nucleotide differences between miRNA family. Cheng et al. have shown that biodegradable polymer NPs, which are coated with cell-penetrating peptides CPP, nona-arginine (ARG), can effectively deliver chemically modified oligonucleotide analogues to cancer cells to achieve therapeutic miRNA inhibition or alternative splicing. (Figure 20) . This NP system could block the activity of the oncogenic miRNA, miR-155, as well as modulate splicing to attenuate the expression of the proto-oncogene, Mcl-1. Regulation of these genes in human cancer cells reduced cell viability and produced pro-apoptotic effects. These findings establish polymer NPs as delivery vectors for nonconventional forms of gene therapy, which have strong therapeutic implications. In this review, we have discussed the uses of multifunctional SPIONs for theranostics applications. The different functionalities of NPs would enable the macroscopic (magnetic resonance) and microscopic (fluorescence) imaging of target cells. The integration of multi- functionalities into a single system would be highly useful for MRI/PET/optical/PDT multimodality imaging and therapy. This system may be suitable for concurrent diagnostic and therapeutic applications. The uses of SPIONs in the area of different drug delivery approaches are indispensable. The clinically approved drugs for breast cancer are doxorubicin and paclitaxel based NP conjugates. Recently, many strategies have been developed to treat cancer by targeting the tumors with gene delivery vehicles such as siRNA, miRNA which have proven to control the tumors. Controlled delivery of alternative splicing and miRNA inhibition induced by nona-arginine-coated NPs. ARG-NPs comprise a spherical PLGA core coated with PEGylated ARG. The intracellular uptake of osmium tetroxide-loaded ARG-NPs was visualized by TEM. scale bars for SEM and TEM micrographs represent 1 μm. Reprinted with permission from Ref. . Copyright (2012) American Chemical Society. Although considerable progress has been made in recent years, the targeted delivery to cancer tumors without affecting the normal cells remains elusive. The judicious combination of NPs with cancer targeting ligands or immunoconjugates would pave the way for an effective therapy. In this regard, more attention has to be devoted on the development of newer drug delivery approaches, employing these multifunctional SPIONs and/or a novel NP formulation containing miRNA. Using Au or QD and/or other polymer NPs, highly sensitive and specific miRNA detection would be possible. Photodynamic therapy (PDT) is another emerging area in cancer research where the uses of up-conversion NPs, QDs and coated NPs with SPIONs are indispensable. The translational research on cancer depends highly on smarter delivery vehicles discussed above without compromising the damage to the normal cells and tissues. STS acknowledges the support from the A*STAR (Agency for Science, Technology and Research) Singapore, Joint Council Office (JCO) Grant No. JCOAG03_FG03_2009, and Science Engineering Research Council (SERC) Biomedical Engineering Program (BEP) Grant No. 103 149 0011. PP acknowledges the support from the LKC School of Medicine, NTU Singapore. Corresponding author: Subramanian Tamil Selvan, Ph.D., Institute of Materials Research and Engineering (IMRE), 3 Research Link, Singapore 117602. Tel: 65-6874-5249; Fax: 65-6774-4657; E-mail: subramanianta-star.edu.sg; biestsedu.sg.